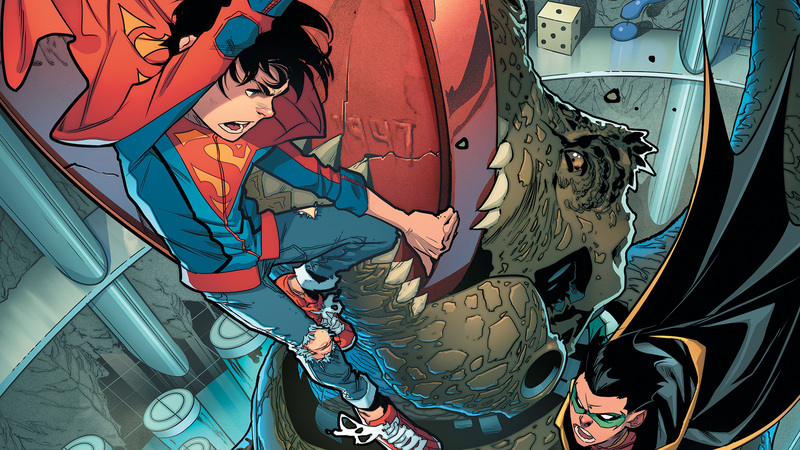 Super Sons #5 Review – AiPT! 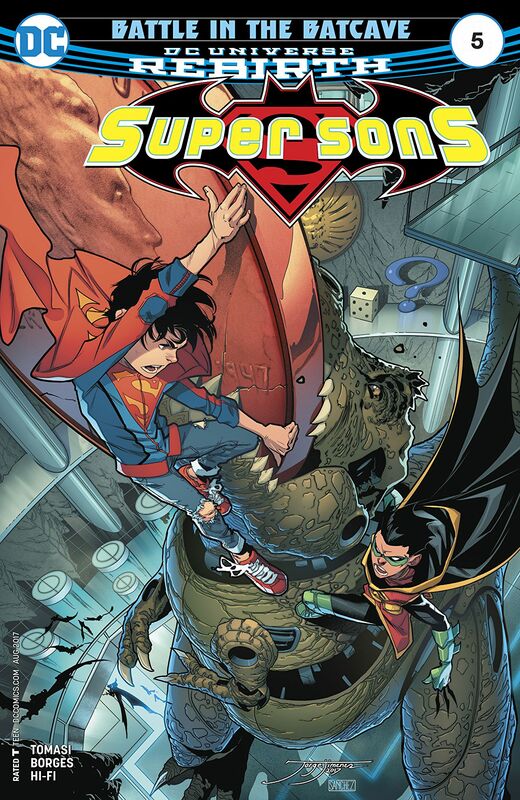 Writer Peter J. Tomasi has tried to make Super Sons a book that will appeal to both adult readers and kids, and this issue is successful at that. It kicks off with a look at how Batman punishes his son compared to Superman. It’s a little difficult to ground a kid who can fly, and he runs off to the Batcave to confront Damian. A fight ensues (the issue lives up to its title), but eventually they figure out how they can work together despite their differences. What makes this particular issue fun is that it humanizes these superhero kids and their fathers. It’s not just about how a kid without powers can work with a kid who has heat vision, but it also shows how two grown-up heroes came together to play on the same side. Batman and Superman have a playful rivalry, so their sons have to figure out how they can have a similar relationship. Humor has also been a big part of Super Sons so far and this issue continues that. There are several jokes throughout, particularly once the adults show up. It’s sad that Jimenez sat out on this issue, but the art by Borges (who recently worked on the Raven mini-series) is very good. The action is dynamic, with the characters bursting out of their panels whenever possible. The Batcave is always a fun place to stage a fight. Super Sons #5 might feel like a quick one-shot story, but it quickly saves itself from being a retread of the early moments in the “When I Grow Up” storyline. It’s important for Jon and Damian to learn how to work together, otherwise this series really will be just 20 pages of two kids arguing every month. Tomasi still hasn’t taken a wrong step with Super Sons. Jon and Damian finally figure out how to work together to move Super Sons forward. Several funny jokes throughout the issue. Dynamic fight scenes drawn by Alisson Borges. Jon and Damian arguing all the time gets tiring (no matter how fun it is), but this issue finally moves their partnership forward.